Where did I get it? I bought it, I think it was on the Guardian YA shortlist earlier in the year? I'd seen it at YA Shot last year though, where my friend Sam bought it. What's it about? Pearl lives at Seed. Seed is a cult, run by Papa S, and where everyone is one big family and where everyone worships Mother Nature. Pearl doesn't know who her real mother is, because everyone just lives as one family, but she's close to Elizabeth, who is expecting another baby. She has siblings of her own age, Jack and Kate, and some younger ones, Bobby and Ruby. The elders, including Papa S, were, I think, the original founders of the cult. At the beginning of the novel, Pearl gets her period for the first time, and is made to go into a dark hole in the ground as she becomes a woman. Later, she has to go to the Forgiveness Room for her impure thoughts, and she's also asked to become Papa S's Companion at one point too. Three newcomers arrive from the Outside - Linda, and her children Ellis and Sophie. Ellis and Pearl grow close and Ellis tells her the truth about some things at Seed, and begins to expose its dark heart. Now, one thing you might not know about me is that my undergraduate degree is in Theology and Religious Studies, and that I am really fascinated with cults of all kinds. So a book like this is perfect for me. I actually wanted more background on Seed and its origins, but I understand that, from Pearl's point of view, there might not be much point in relaying that information, as she has lived her whole life in Seed and nothing about it is strange to her. I felt like putting Nature at the centre instead of God was a really good decision by Lisa as it seems a little bit less controversial. 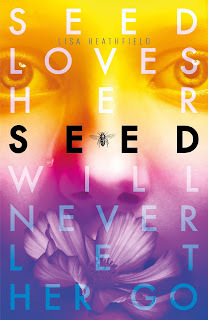 I believe Seed is going to have a sequel and I'd definitely be interested to read it. When I read Paper Butterflies it absolutely destroyed me. I finished it about 3am one morning and wanted to throw it out of the window! Last weekend, at YA Shot, I took Seed to get signed and said to Lisa that I hoped that Seed wouldn't break my heart the same way Paper Butterflies did. She promised me it wouldn't and, well, she lied! The ending absolutely did me in! I think there is a paucity to Lisa's writing which really adds to her work and which is in no way a criticism - it makes the reader work and makes the reader more invested in what happens to the characters. How many stars? Eight and a half out of ten, it's really good! Where is the book going now? I'll keep it, because Lisa very nicely signed it for me! Have you read The Sacred Lies of Minnow Bly by Stephanie Oakes? That is also about a girl growing up in a cult in rural America - a particularly isolated, patriarchal one too. It's a very dark read, though, with some truly horrific moments.